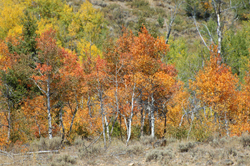 See them while you can: The fall weather has arrived, and with it the turning of aspen leaves all over the Wood River Valley. Forecasters say the weather will turn cooler in the coming week, with nighttime temperatures in the low 30s. Hikers and bikers say the leaves are turning all over the valley, especially in the Boulder Mountains and along the Wood River Trail. These mature Idahoans are eager to work.